I was speaking at an APSE seminar at Hampden today entitled Financial Armageddon or Managed Transition. There were two thoughtful overview presentations from The Improvement Service and APSE, followed by three case studies from Scottish local authorities. There was a common understanding that increasing demands on services were as big a threat to council finances as the cuts in funding allocations. After setting out our different starting point over the cuts, I then dealt with some of the main strategies councils are using to address the financial crisis. In particular a plea to examine much more carefully the claims made by management consultants about savings from outsourcing. We have a new generation of senior council officials who weren't around when we had CCT and I have seen a number of reports to councils that are fantastically naive. There is a real need to make better use of the APSE network data and understand contracting models. My main pitch was to consider a new approach to service delivery. At a strategic level this should be based on local integrated services within councils; strengthening local democracy through real user involvement. Services should be designed from the bottom up, rejecting the public service factory approach of top down shared services and artificial front office/back office splits. This approach gives staff the freedom to design the service around the principle that most user demand is dealt with locally, first time. This needs to be underpinned by an effective change process. Forget heroic leadership; what we need are co-operative models of leadership that recognises the complexity of public service provision. This needs a new approach to staff development and training that puts a premium on the public service ethos, rather than attempting to copy business models devised for the market realm. I set out examples of partnership models that actually work and deliver sustainable change. However, most importantly this approach has to be underpinned by an organisational change agreement that provides job security. This gives staff the space and confidence to innovate. I ended by urging councillors and chief officials to shout for local government. There is a real risk that if many of the current reorganisation proposals are implemented, very few services could be left under local democratic control. There are alternative models of integrated local service delivery, but all of us who care about local democratic accountability need to speak up for them with a common vision and a coherent voice. I took part in a debate today at the annual voluntary sector event, The Gathering, entitled The Big Society, the Good Society – what future for civil society in Scotland. My first reaction to David Cameron’s speech on the Big Society was actually quite positive. After all here was a Tory leader using the ‘S’ word when his mentor Margaret Thatcher famously said “I don’t believe in society. There is no such thing, only individual people, and their families”. I quote it in full because some on the right now try and argue she didn’t actually say this. Sadly my positivity didn’t last long when the Tories came to power. The Big Society quickly became a cloak for the ideological dismantling of the state. Cuts that undermine the voluntary sector as much as public sector and close many of the facilities that are the bedrock of local communities. I also have a problem with the politics of the Big Society. It claims to support fairness but ignores the economic causes of unfairness. It favours democracy but offers no constitutional reform and it talks about mutualism but remains committed to market mechanisms. In total, it seems to add up to little more than a call for volunteering. It is not surprising that polls show people don’t understand the concept or are sceptical. So what does this mean for civil society in Scotland? Of course almost all of the actual measures don’t apply in Scotland, but the concept? I argued that we may ditch the Big Society brand, but that doesn’t mean we shouldn’t debate the concept of society. I work for a big voluntary organisation. I believe in community and play some part in it by belonging to national and local organisations that reflect issues of concern and interest to me - from climate change to real ale. Sometimes this is just membership support and at other times I take action. That can include practical action including intervening when an elderly neighbour was harassed or getting together with other residents to stop a developer building flats on my local park. I therefore believe in community action, but where do you draw the line between community action and the role of the state? When my mother comes out of hospital and needs social care we look to support from her GP and Social Work. We want a service that meets her needs but we don’t want the hassle of a budget or a ‘choice’ of providers through direct payments. Although I accept that this may be appropriate for others. Do I want my local library run by volunteers? Probably not. I suspect the worthy committee might want to make decisions on which books to buy that are better left to professional librarians, with their independent standards and access to a network of library services. You could argue that the solution to that dilemma is with me to participate. But like many people in this over worked society, my time is limited. By the time I get home, eat and have some quality family time, there is little left over. This is reflected in the Big Society polling evidence. When the Big Society is explained people are generally fine with the concept. But when asked if they are prepared to do more they indicate that this is the role of the state. Of course they are less enthusiastic about extra taxation, a paradox often described as Scandinavian services on US tax rates. There are other paradoxes. We live in an amazing society with new technology, consumer access, greater wealth overall and more tolerance of diversity. On the other hand we have grotesque inequality, poor mental health, rising alcoholism and drug addition. So for me the Good Society is about a much more fundamental change than who runs my local care home or library, important though I think that is. It’s about tackling poverty, the work life balance, improving children’s life chances, protecting our environment and securing the opportunities, as well as meeting the challenges, of an aging population. Above all it’s about inequality. More equal societies do better on every count. That’s the real ‘Good Society’ and frankly we can’t expect a millionaire Prime Minister, in hock to the hedge fund managers for his party funding, for action on that! A year ago I spoke at the launch of a new guide Managing Occupational Violence and Aggression in the Workplace. This is aimed primarily at local government and was the culmination of over a year's work by a band of council safety managers and myself in conjunction with the Centre for Healthy Working Lives. Today we met in Glasgow to review progress. There has been an increase in violent incidents in Scottish local government last year. That is not necessarily a reflection on the policy and it may demonstrate better recording as a result of new systems and greater awareness. However, in UNISON's annual survey we asked councils what action they had taken in light of the new guidance. The discouraging answer was, not a lot. In fact most councils couldn't identify any action at all. This is reflected in other responses to the survey. Whilst there had been some real improvements in a small number of councils, the usual suspects had all the same problems of poor recording and evaluation. There is a real concern that as the cuts in local government bite deeper, there is likely to be an increase in user frustration that could lead to even more violent incidents. The HSE cuts means that we can't count on them to be monitoring poor practice. So it is up to our Safety Committee's to raise the issue and for CoSLA and others to promote best practice. It was recognised at the meeting that at the very least you would have expected is a review of existing policies and systems. This is something that we will focus on in this year's survey. Naming and shaming will be the approach, so the councils concerned have been warned! No one ever accused the CBI of subtlety. Their latest effort to rustle up work for their members is a call for private companies to have a ‘right to bid’ to deliver public services. This is a retro policy in so far as we have done all this before. Compulsory Competititive Tendering (CCT) and market testing was the 1980's version of this. That's why we have described this as a "Thatcherite Wonderland". The result was a complex chain of contractual relationships with huge costs for public services. This proposal goes even further than CCT, requiring an army of people to manage it, taking staffing resources away from delivering frontline services. The evidence on privatisation, outsourcing and shared services is not that they are cheaper and better run – quite the opposite. We have seen time and time again the huge failures of privatisation. A perfect example is the outsourcing of hospital cleaning which resulted in the number of cleaners being cut in half and hospital infections rising as a result. Last week I highlighted the evidence of G4S work in England. No wonder they wanted to highlight South Wales and not Staffordshire where the contract now costs the force three times more. In November last year, a leaked report revealed that British Telecom was overcharging Liverpool City Council by £10 million a year for outsourced services. It highlighted that the council could save £23 million a year by cancelling the contract for IT services and a call-centre operation, and taking the work in-house. Integrated public service delivery is by far the best way to manage essential services. Harking back to the failures of the 80's is a pretty poor contribution to public service reform. Today I have finalised UNISON Scotland's submission to the Scottish Government's consultation, Securing the Benefits of Scotland’s Next Energy Revolution. We would agree that Scotland’s geographical advantages open up significant economic prospects in the field of low carbon and renewable energy. There is a welcome commitment that Scotland should consolidate its position as a net energy exporter. I can recall the time when SNP policy was being guided by an academic who essentially argued for a ‘Scotland only’ energy generation policy. There does need to be some caution against raising expectations of the scale of economic benefit. Successive governments and their agencies have published predictions on job creation that have rarely been realised. Whilst low carbon energy should undoubtedly be the focus of a Scottish energy strategy it is important that the government does not lose sight of the importance of a balanced energy policy if Scotland’s security of supply is to be secured, let alone our export potential. North Sea oil and gas production in Scotland is reducing at the same time as our coal and nuclear electricity generating plants are approaching the end of their economic life. Within ten years Scotland will lose around 30% of its electricity generating capacity from large plants and within twenty five years we are likely to lose all our capacity from these facilities. UNISON Scotland holds the view (see our Scottish energy strategy) that all energy sources need to be considered as part of that energy mix and we cannot exclusively rely on renewables. Much of this consultation paper, unsurprisingly from an SNP government, focuses on getting energy revenues and further powers from the UK Government. Scotland is part of the UK and revenue and expenditure has to be seen in that context. Whilst it would be beneficial to Scotland to extract one or more favourable tax streams, we need to recognise that these are part of a larger and more complex tax and spend environment. Arguments about what was generated in ‘Scotland’s waters’ means little in this UK context and the obvious political message in this paper undermines the importance of developing a coherent energy policy. Having said that UNISON Scotland supports the devolution of energy policy and can therefore support many of the proposals in the paper. Greater control of the Crown Estates and a register of community benefit in particular. Sadly, there is no mention of the role of local government and planning functions are under further pressure as a result of spending cuts. We have common ground on the issue of transmission charging for electricity. The Ofgem charging system results in generators from Scotland and Northern England paying the highest grid charges in the UK. Generators in the North of Scotland pay £21.58 per Kh compared to a subsidy of £6.90 per Kh in London. We support the ‘postage stamp’ principle of a flat rate for all generators and hope the Ofgem obsession with competition policy will not block this solution in the TRANSMIT review. Overall, putting the obvious political messages to one side, there are positive proposals in this paper. This is one of many Scottish Government initiatives on energy policy and perhaps now is the time to consider some greater coordination. The Royal Society of Edinburgh produced a thoughtful report on a Scottish energy strategy in 2006 and they recommended such an approach. An incoming administration would do well to take a second look at their proposals. The Scottish Government has launched a consultation on the future policing of Scotland, with a strong steer that they favour a national police force. The ministerial foreword has the usual political spin about 1000 extra officers, with no mention of Police staffs who deliver a wide range of essential services. Sadly, this is the Cabinet Secretary yet again giving the appearance that he is rooted in 1970's policing. The current structure of police boards is simply an historical legacy from the last local government reorganisation with huge differences in geography and population. It is therefore perfectly reasonable to look at the structure - but is a national force the way ahead? The main driver is clearly cost savings, "to ensure that resources are focused where they matter – on frontline policing and the needs of communities", to quote the Cabinet Secretary. Fine rhetoric, but the claimed savings have been questioned by a broad group of people who understand policing, 'fanciful' by others. The cost of change will be huge and the transactional costs of running national systems will be significant. Another driver is national accountability. Ministers get lots of grief, but have limited levers to do anything about the issues they have to answer to Parliament for. In my experience most ministers in any government start their term of office in favour of decentralisation and end up wanting to run the service themselves. And here is the big concern. How do you run a national police force without political control over operational issues? There are some international models, but they don't easily fit into our constitutional culture. There is a huge emphasis in the consultation on strengthening local accountability. We even had the Cabinet Secretary in Arran yesterday claiming this was a model of local policing the rest Scotland should follow. Now Arran is a lovely place, but hardly representative of Scotland as a whole. Those of us who have worked with the police for many years would recognise a highly centralised, hierarchical management culture. Not one that has much time for local flexibility of the type envisaged in the consultation paper. Any councillor will tell you that their community police officer is great, but they are always being redeployed elsewhere by direction from senior officers. The other police management culture is what I would describe as 'initiativeitus'. If knife crime goes up then the managerial reaction is to set up an 'initiative', staffed by a special team that often draws officers and staff from community policing. A similar problem is the performance management systems. Lots of data collection and targets that every police officer and staff knows how to game with. It is frankly hard to see how this ingrained management culture is going to allow the space for local accountability. Proposals for a national police force, or for that matter a national fire and rescue service, need to be viewed in the context of the wider review of public service delivery. It is hard to see how the vertical integration of a single service fits in with the need for integration at local level to achieve common outcomes. Reducing crime is not the sole preserve of the police, it requires community action joining up a range of services. I am not offering any conclusions either way, but at this stage there are some big difficult questions for the supporters of a national force to answer. A story in today's Scotsman newspaper about the privatisation of police custody cells has attracted a lot of interest. In essence the private security firm, Group 4, are making a pitch to two unnamed police boards to privatise police functions. As I have said in several TV and radio interviews, this has to be one of the craziest ideas dreamt up in the desperate attempt by some Chief Constables to save cash. Why? Firstly, the offer is to help police boards with their 'aging estate'. This is code for a Private Finance Initiative type deal that we have plenty of experience of in Scotland. It involves paying private contractors several times over for an asset that could be purchased at a fraction of the price using conventional borrowing. Group 4 are experts at lining their pockets from this sort of deal, including an annual profit of £417m on their private prisons. Secondly, Group4 have such a poor reputation in England that it is no surprise that they are making a pitch in Scotland. This is the company that ran the Campsfield Detention Centre, the scene of suicides and violence before the inmates burnt it down. Then there is Yarlswood, that suffered a major fire costing £millions after Group4 ignored Fire Brigade advice on installing a proper sprinkler system. Only last week the Guardian ran a story on Group4's management of deportation flights staffed by untrained and unaccredited staff. A senior staff source described this as 'playing Russian roulette with detainees lives'. I could go on but you get the picture. The question to be posed is who would want their son or daughter in the hands of this company. Police custody is a serious business and it should be staffed by properly trained custody staff. It's no place to cut corners for private profit. One of the police forces in England that tried this is Staffordshire. As a result of an FoI request from the UNISON police branch we now know that the service costs three times more than the original cost of the in-house provision. Staffordshire Police resisted the FoI request and the branch had to appeal. Hardly surprising that they wanted to keep these numbers quiet! Much is being written about the demographic time bomb and the impact it will have on the future delivery of public services. I would hope to be part of that demographic change although the life expectancy of males in my family doesn't bode well on that score. West of Scotland genes obviously run deep! Perhaps it was this that made me look a little deeper behind the numbers. The headline figures are indeed stark with the IBR identifying a 40% potential increase in age related spending by 2057. However, we should view this figure with some caution. In particular other public spending will fall as result of the same demographics, reducing the net increase to around 10%. Then we should challenge the assumption that the disability ratio does not improve. In other words there is some evidence that we may be getting older, but we are also getting healthier and these may offset each other. For more on this read Remeasuring Aging by Warren Sanderson in Science magazine (September 2010). My other concern is that demographic change is consistently portrayed as a crisis. I reflected on this after reading the January Holyrood Magazine supplement on older people. This used a particularly negative, and typically barking, Adam Smith Institute report on demographic change, followed by lots of articles on 'the crisis'. Even if the headline statistics are true I can still see some positives from demographic change. Better health and wellbeing should be something to be welcomed, along with more economically active older people contributing to the economy and supporting their families. Informal care is just one example. Older people are also the core of the many local organisations that are at the centre of our communities. They bring not just their time, but a wealth of experience. In this context we should not treat older people simply as an item on a balance sheet. Many of these benefits depend on better health in old age. Tom Kirkwood at Newcastle University's Institute for Ageing has done a lot on this. He highlights the importance of work design during working life and in particular the level of work autonomy. His emphasis on income equality reflects the Spirit Level (Wilkinson and Pickett) analysis, including the importance of better education. In addition he focuses on social cohesion using the example of the impact on the health of Russian citizens after the collapse of the Soviet Union. All of this highlights the importance of us having a comprehensive older peoples strategy, including preventative spending, not just a care strategy. I have spent this morning drafting a submission to the Expert Panel on Scottish Labour's plan for a National Care Service. Plenty of questions for them to consider as there is with the Scottish Government's similar lead commissioning model. As yet we are not convinced that major organisational change is the right approach, but the debate is justified. All we need to remember is that demographic change may not be as big a crisis as it at first appears and it could have some positives as well. It was the second meeting of the Kier Hardie Society today. The aim of the society is to keep alive the ideas and promote the life and work of Keir Hardie the founder of the Labour Party. Note, this is about the ideas as well as the history. The meeting was held in Cumnock where Hardie lived for most of his life. We started with a business meeting in the Town Hall where there is a fine bust of the great man sculpted by Benno Schotz. It was well attended and there is plenty of interest in the project, not only in Scotland, but around the world. We then visited the Baird Institute with its Hardie Room full of memorabilia and a fine collection of photographs maintained by the staff of East Ayrshire Council. A short walk from there is the Congregational Church where Hardie preached occasionally before falling out with the church deacons. 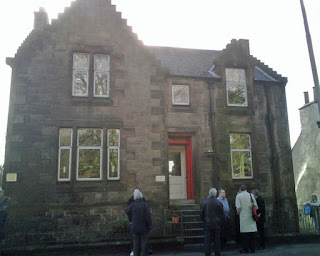 Then along the road to Hardie's home, Lochnorris House. Now owned by a former Nalgo Branch Secretary I worked with when I first came to Scotland. Finally, the family graveside in the old cemetery. The weather was kind to us and it was an enjoyable day. A range of activities are being planned to take the society forward over the next year. If you would like to join the Society the Acting Secretary is Richard Leonard at the GMB and the candidate for this seat in the May elections. The ideas and heritage of Keir Hardie couldn't be in safer hands. 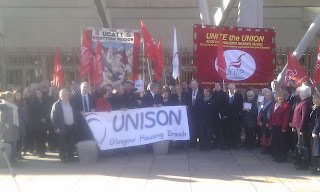 I took part in yesterday's STUC housing lobby of the Scottish Parliament. There was an excellent turnout of housing staff, tenants organisations and housing associations in an attempt to push social housing in Scotland further up the political agenda. The bottom line on housing is that Scotland needs more affordable housing, built and maintained to higher standard. This is not only good for housing but also for the economy by creating quality jobs. Around 19,000 additional households require housing every year and some 250,000 people languish on housing waiting lists. The housing budget is suffering a massive cut in the Budget Bill and spending plans for the coming year. The Scottish Government's plan is to spread the limited cash ever more thinly. As a number of speakers pointed out, councils and housing associations do not have the reserves to plug the gap on the funding for each new house. Therefore, they either won't be built or HA's will have to borrow at high cost and pass the burden onto the tenants through higher rents. In fairness the Scottish Government has taken a number of positive actions in housing policy. A partial end to the right to buy should stop the hemorrhaging of our social housing stock that has resulted in 400,000 houses in Scotland being lost to social housing. The small (3,300 houses) reinstatement of council house building may be a drop in the ocean but it does at least create a welcome ripple. The social housing charter and stronger regulation of the private rented sector is also welcome. The lobby put a particular focus on the Con-Dem coalition's cuts in Housing Benefit (see my post below). Expert speakers predicted this would impact on all tenants with up to 110,000 people in Scotland being forced to move house, when alternative smaller accommodation is simply not there. There was a further concern over the quality of housing. Fuel poverty is supposed to be eliminated by 2016. However, 45% of rural households and 30% of urban ones still live in fuel poverty and rising energy bills are likely to increase those numbers. A big energy conservation programme would help and create new jobs quickly. Parliament today will finalise the spending allocations for Scottish local government following on from the Budget Bill debate yesterday. Much sound and fury as usual in the chamber, but the phrase 'moving deckchairs around on the Titanic' more accurately captured my feeling watching the debate. Shifting a few million here and there simply misses the point. This budget may put off a number of difficult spending decisions past May, but it will result in massive cuts to our essential public services. The approach to local government is of particular concern. In November’s draft budget, the Government presented councils with a Hobson’s choice: deliver key SNP policies, such as freezing the council tax and maintaining police and teacher numbers, or face an even bigger cut in your budget allocation. The Government claimed that councils who signed up to the ‘package’ of Government priorities would face a cut of 2.6 per cent, while councils who did not would face a cut of 6.4 per cent. The continued council tax freeze prevents councils from raising vital funds and at the same time provides a real-terms tax cut to the wealthiest homeowners at the expense of vital services. The demands to recruit 1,000 extra police officers is simply a cosmetic political exercise. It simply means that large numbers of police (civilian) staffs will be cut. This will mean fewer police on our streets as they are taken off normal duties to perform administrative and specialist tasks they are not qualified to do at a greater financial cost to the public. The Scottish Government started well in trying to forge a new relationship with local government. Less central control, reduction in ring fencing etc. However, they have now moved full circle in this settlement by dictating how council budgets are spent. In our response today UNISON describes this as ‘handcuffing’ local authorities, sounding the death knell for local democracy. Democracy is the defining difference between public and private services and it is vital local authorities are able to allocate funds based on the local needs of their communities, not political spin. On the day the Scottish Parliament is setting a budget that implements the Con-Dem coalition's cuts, it is perhaps a good time to look at some alternative means of financing public services. I have just read 'Tax Havens: How Globalisation Really Works by Palen, Murphy and Chavagneux. This is everything you wanted know about tax havens and everything you feared would be the case. The authors take us through the history of tax havens, how they work and set out some vital statistics. They reckon individual annual tax loss amounts to over $255bn and that figure is dwarfed by corporate tax dodging. In the UK alone 30% of the largest companies don't pay any tax. Half the global stock of money goes through tax havens. They then show us how rich individuals and corporations use tax havens to dodge tax. The array financial instruments, offshore companies etc is truly staggering. All of this is facilitated by the 'Big Four' international accountancy firms. This includes our old friends KPMG, caught out again, this time by US tax authorities. They were fined $456m for selling tax evasion products worth $1.4bn that they netted $124m in commissions on. The ECJ also concluded that another KPMG scheme was an improper attempt to avoid VAT. And they want to tell us how to run Scotland's public services! The book highlights a particular concern over the impact on the developed world, with $850bn flowing out into tax havens, ten times the total world aid budget. Another big loser are the salaried middle classes who are paying for the tax dodging rich. There is some hope that the latest financial crisis is leading to a renewed attack on tax havens, or at least the secrecy that surrounds them. Including the OECD, G7 and countries including the USA, Germany and France. Sadly the UK is not rising to the challenge particularly when many tax havens are British dependencies. In fact they are going in the opposite direction. As George Monbiot has highlighted in the Guardian the Con-Dem coalition is planning the biggest corporate tax cut in history. "At the moment tax law ensures that companies based here, with branches in other countries, don’t get taxed twice on the same money. They have to pay only the difference between our rate and that of the other country. If, for example, Dirty Oil plc pays 10% corporation tax on its profits in Oblivia, then shifts the money over here, it should pay a further 18% in the UK, to match our rate of 28%. But under the new proposals, companies will pay nothing at all in this country on money made by their foreign branches. Foreign means anywhere. If these proposals go ahead, the UK will be only the second country in the world to allow money that has passed through tax havens to remain untaxed when it gets here. The other is Switzerland. The exemption applies solely to “large and medium companies”: it is not available for smaller firms. The government says it expects “large financial services companies to make the greatest use of the exemption regime”. The main beneficiaries, in other words, will be the banks. But that’s not the end of it. While big business will be exempt from tax on its foreign branch earnings, it will, amazingly, still be able to claim the expense of funding its foreign branches against tax it pays in the UK. No other country does this. The new measures will, as we already know, accompany a rapid reduction in the official rate of corporation tax: from 28% to 24% by 2014. This, a Treasury minister has boasted, will be the lowest rate “of any major western economy”. By the time this government is done, we’ll be lucky if the banks and corporations pay anything at all. In the Sunday Telegraph, David Cameron said: “What I want is tax revenue from the banks into the exchequer, so we can help rebuild this economy.” He’s doing just the opposite. These measures will drain not only wealth but also jobs from the UK. The new legislation will create a powerful incentive to shift business out of this country and into nations with lower corporate tax rates. Any UK business that doesn’t outsource its staff or funnel its earnings through a tax haven will find itself with an extra competitive disadvantage. The new rules also threaten to degrade the tax base everywhere, as companies with headquarters in other countries will demand similar measures from their own governments." So there you have it, official government policy in the UK is to promote tax havens and make the rest of us on PAYE pick up the bill. Why? Another story in today's news may give us a clue. Half of all Tory donations come from the City. More precisely, from the very same hedge funds that make extensive use of tax havens. The US authorities found 18,857 businesses registered at just one address in the Cayman Islands. As President Obama said "that's either a very big building or a very big scam'. I think we know which! The Scottish Council for Voluntary Services has launched their manifesto for the Scottish elections. There is much in this document to support and most would agree that Scotland needs a thriving third sector. A new approach to social partnership in Scotland is also a positive idea. The voluntary sector is an important contributor to the design and in some cases the delivery of public services. They can provide innovative and flexible services, enabling new approaches to be piloted in ways that can be difficult for core services to undertake. They often share the public service ethos that is absent from the market realm. It is of course important to recognise the diversity of the sector. We should distinguish local community organisations with their role in community planning and national campaigning organisations that promote and represent service interests, from the role of semi-commercial service delivery organisations. My problem with the manifesto is those sections that have clearly been influenced by the SCVO's big funders, the semi-commercial delivery organisations. The emphasis the SCVO has given to these sections of their manifesto, drown out the rest. Complaints about protecting the 'bloated' public sector, the need to expand the third sector's role in delivering public services etc. This takes the SCVO perilously close to the business lobby agenda. In fact their spokesperson on Sunday's Politics Show talked about opening up services to the voluntary and private sectors. Of course he used to be a lobbyist for the business lobby, but if this is a new strategy to join up these positions, it is dangerously naive. Due to EU procurement legislation this approach opens services to contestability and in some sectors, notably care, has created an opening for poor quality private sector providers to start a race to the bottom in terms of quality. It may initially award contracts to the voluntary sector (or even small business), but the end result is big private sector care operators with their minimum wage, corner cutting approach that has been highlighted in so many care scandals. Ironically, outsourcing in the voluntary sector has thrown up some difficulties this week with the news that the company running the Salvation Army's clothes recycling made £10m out of the charitable donations. Much is made in the SCVO manifesto and recent press releases about how wrong it is to protect public sector jobs. This confuses attempts by the Scottish Government to avoid complusory redundancies with job losses. The SCVO jobs watch this week stands at 134 jobs. UNISON's public sector jobs watch stands at over 12,000 with much more to come. So this spin is just absurd. Job losses are bad news to both sectors and the Scottish economy, but if the SCVO have a strategy that attempts to divide public and voluntary sector workers, then they will win few friends anywhere. In the wider context of public service reform the voluntary sector does offer the prospect of better community engagement, but of course it is not democratically accountable. Some organisations have poor governance, are captured by managerial elites and are run with poor management of staff. In this context there is a need to be able to find a role for the voluntary sector that captures the best features of the sector without damaging the overall approach to integrated service delivery. UNISON Scotland has today launched its evidence to the Christie Commission. We argue for a new approach to public service delivery that views the service from the service user perspective. In that vision there is plenty of space for the voluntary sector. UNISON Scotland will today launch our manifesto for the Scottish Elections in May. In past years we would have pulled this document together from our bank of policy positions over a period of months. This time we decided to do it differently. We started our manifesto project some 18 months ago by identifying twelve core issues for UNISON members. Some broad issues and others more service specific. We encouraged activists to sign up to network groups on each issue and promoted a debate amongst members through our web site and in our publications. We have used the output from these groups to input into the political party manifesto processes, some being more open than others, and contributing to wider debate across civic society on these issues. So the document we are publishing today (available on our website) is more the culmination of the process than a starting point. As we say in the introduction, our vision for Scotland is different. Public services are part of the fabric of our society. An attack on those services is an attack, not on unions or workers, but on society itself. We set out a different approach, one that is rooted in our members deep understanding and commitment to those public services. We do nice photies as well! Interesting story in the Herald today about the accountancy firm KPMG. This is the firm that claims to be able to reduce costs in the public sector whilst at the same time making a lot of cash out of its public sector contracts. No discount there! They are also significant players in the commercial lobby to privatise Scottish Water. Administrators from KPMG who were called in to Glasgow jewellers Martin Groundland have had a £518,000 bill reduced by £77,000 after a judge ruled that parts of the claim could not be justified. According to the story they may have been charging £100 for phone calls a few minutes long. Not bad work if you can get it! KPMG also explained that its spreadsheet system “does not and cannot specify the particular work done." Can this be the same firm critical of public sector work practices? According to KPMG it is “not uncommon for courts to reduce the fees of accountants and solicitors without any question of overcharging or malpractice”. I have to say I struggle with that explanation, but perhaps the Accounts Commission and those public bodies who have shelled out vast sums to KPMG over recent years should take a closer look at their bills? When asked to comment on this work my reaction was that this is exactly what we warned would happen when these schemes were signed off. PFI contracts are effectively ringfenced, so when public finances get tight they take up a larger proportion of total spending. No one in their right mind signs off 25 year plus contracts because you simply cannot anticipate developments in both public finance, inflation and service need that far ahead. It may be slightly childish to say 'I told you so', but we did. I personally stomped the conference circuit, told politicians and officials as part of a small band of sceptics at the time. The Tories introduced PFI for largely ideological reasons. Labour continued with them because it provided off balance sheet funding for new schools and hospitals. The SNP scaled back but have now returned to the trough. Politicians have to learn that there is no such thing as a free lunch in relation to capital finance. Sadly we are now paying the price of that hard reality. The work that UNISON, the Cuthberts and others have done on this issue has been greatly facilitated by freedom of information laws. All of these deals were done in great secrecy because those doing them knew full well that the numbers simply didn't add up. Sadly this message seems to have passed the Scottish Government by. In December 2009 the Scottish Government said it was considering extending FoI to firms who have public sector contracts, as well as Trusts running local authority sports, leisure and cultural facilities amongst others. But the Scottish Government said last Wednesday - just as Tommy Sheridan's perjury sentence was dominating the news - that the proposals would not proceed. Parliamentary business minister Bruce Crawford said it would be "premature" to extend coverage before other deficiencies in the Act can be put right. Information Commissioner, Kevin Dunnion has rightly commented that Scotland is at risk of falling behind in FoI best practice. The lesson of PFI is that openness is the only policy and the Scottish Government is wrong to cave in to business interests on this issue.